Sometimes it pays to just shut up. This October, advocacy group Americans for Safe Access posted the latest training article from one the main opponents of medical cannabis in the state — the California Narcotics Officers Association. 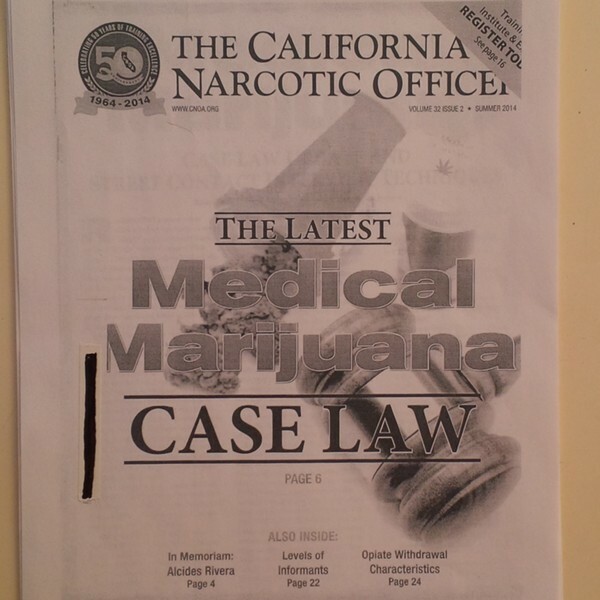 In the summer 2014 edition of the group's quarterly magazine, The California Narcotics Officer, an article detailed some of the more unsavory ways police attempt to discredit and imprison qualified medical cannabis patients. A 2014 training manual for 'locking' California patients into incriminating statements about marijuana. Here are ten questions police are using to strip a medical defense from a patient they stop. 1) How much marijuana are you carrying? Under Prop 215, qualified patients can have as much is medically necessary. Officers look to poke holes in that medical necessity by proving you are carrying too much. 2) How much do you use on a daily basis? An officer may try to use this amount, coupled with the next question to initiate an arrest. 3) How long are you going on your current trip? How much you use per day, times the length of your trip determines what could be deemed medically necessary. Anything over that amount could be grounds for an arrest. 4) What’s is your illness or disease? The key here is to try to get you to say you do not have a serious illness. Failure to state your doctor’s name could be used as evidence of lack of medical necessity. 6) Would you send your parents to this doctor? The officer is trying to build a case the recommendation is invalid. 7) What time of day do you use? Police can use this as evidence that you were driving under the influence. 8) How long does the dosage usually last you? Again, can be used as evidence you were driving under the influence. 9) Who do you work for? 10) Do you grow your own? Patients sure of their rights might be tempted to admit they do. Officers can follow that up with: "How much?" and "What is your yield?" in order to widen the stop to a home search, and build a case you grew more than was medically necessary. California attorneys who represent defendants accused of marijuana crimes said patients shouldn’t be talking to the police about any of this. Police will not necessarily read you your rights during questioning. “Miranda warnings rarely happen when they are supposed to and are usually too late,” states attorney Lauren Vazquez in an email. "This article reinforces the need to not make any statements to law enforcement other than invoking your right to remain silent, not to consent to any searches, and requesting to speak with your attorney,” states attorney Joe Rogoway. “Cops’ jobs are not to discover the truth, but to investigate cases and forward them for prosecution with the goal of conviction and incarceration. Unfortunately, CNOA continues to put ideology ahead of science by ignoring the will of the voters while pushing an antiquated agenda funded through mass incarceration." “I hope this article assist you in fighting the good fight,” wrote Cimino.